Growing up in the United Kingdom, tea is a part of everyday life and has featured in my family’s daily routines and important life events for as long as I can remember. Growing up, tea always meant black tea, most often with milk and, as in most British homes, consumed throughout the day from breakfast till bedtime. In most British households any event is marked by a cup of tea: arriving at the house, coming in from the garden, standing around in the kitchen. Tea was traditionally made in a pot with the teabag left in to make it really strong; the success of the tea making was judged by the color of the tea once milk was added, rather than the flavor. From the age of fourteen, I worked in a pharmacy after school. On Saturdays after work, my mum and I would walk to the local town and go for a cup of tea. It was at this time that I started to explore different types of tea, mainly Earl Grey, or Darjeeling as a treat, and as time went on I started to drink tea without milk, which is key to starting to explore tea in more depth. It may have even been my first break with British tea culture. Like my first experiences with tea, my upbringing and culture is most definitely British, even suburban British (I grew up about an hour from London), but I was lucky that my family was curious about the world and other cultures. We started traveling within Europe when I was about seven and by my early teens we were venturing further afield and spending time in countries such as Egypt, Thailand, and Malaysia. I remember feeling a different energy within me when I stepped off the plane, a mixture of excitement and slight anxiety at the unknown. I still get that feeling today and it is invigorating, a true feeling of what it is to be alive. My memories from my early travels are of specific moments, experiences, and people we came across. On a visit to Luxor, we met a lovely man with a couple of donkeys walking in the sand dunes. I pestered my dad, saying how much fun it would be to go on a trek. The man gave us his address, and the next day we crossed the Nile to visit his home. He paired me, my mum, and dad with a donkey each and we took a harum-scarum donkey ride through the countryside. I guess I was learning to offset the risk of doing something a little differently than everyone else with the reward of a great experience, a lesson that stuck with me. While my love of travel and adventure remains, it’s paired with a fondness for my Saturday afternoon tea ritual that lingered, even strengthened, through university and into my working and married life. I would always insist that my husband and I took time for tea, time to talk, time to reflect and discuss our week, our direction in life, our goals. It was these moments over the years that started to shape our future in tea. Before I explain how that developed, it is important to say that Rob’s journey into tea was very different to mine. He did not enjoy the bitter taste of teabag tea, and when we met he drank no hot drink other than hot chocolate. His view on tea was transformed on a day in the Darjeeling hills. Rob and I met at university and by the time we married in 2003, travel was a deep part of our relationship. In 2007 we took time out from work to travel around India. This trip, and especially an afternoon spent tasting tea with Rajah Banerjee of Makaibari Tea Estates, forever changed Rob’s experience of tea and it completely blew open my views and expectations on what a cup of tea could offer. No longer was tea just a drink. The amber liquor of Makaibari’s finest Darjeeling, served alongside a good dose of Banerjee’s philosophy on life and tea, was an experience. I felt that same excitement I did riding the donkey in the dune. Rob felt an excitement, too. When we left that office I vividly remember standing on the road outside the town of Kurseong, a sample of tea in my hand, saying to Rob that there was nothing like this tea at home, saying I wanted to meet more people like Banerjee and see what else was out there. We went back to the hotel and resolved to do just this. I’m not sure we imagined having our own tea company at this point, but a seed was sown. Back in London, we made some calls and asked for advice. We sent e-mails and in most cases people responded. This led to more meetings, more thinking about why we were pursuing a life in tea. We started to receive and enjoy samples of great tea from around the world—while enjoying them at home it became even more apparent that high-quality tea and the accompanying experience were not readily available in the UK market. It was disappointing. We wanted a space to enjoy tea, take time, and learn a little through the experience, so we started to put together a skeleton plan of the type of space we would like to spend time in. With a challenge to put our ideas into a proposal, a few things became more clear. We wanted our company to be as much about the people involved in tea’s story as the tea itself. We wanted to directly trade with tea gardens and put an emphasis on understanding provenance and production. In short, we wanted—as we do now—to take the longer path, one that would foster lifetime learning about tea and build an appreciation of tea as an art, as well as a drink. Armed with a much clearer goal, we set off for Japan in 2009 to expand our tea horizons and immerse ourselves in Japanese tea culture. We enrolled in classes to learn more about ceremonial preparation of Japanese tea and visited gardens and teahouses. We saw big differences between the roles tea played in Japan and India. Here, the tea grown in the country was enjoyed as part of daily life and had a place in important cultural practices. In Darjeeling, tea was certainly part of life but more as a way to earn a living. There was little Darjeeling tea to taste along the roads; it was reserved for the high-end tourist hotels. As in the tea office in India, the tea we enjoyed and spent time over with Indian tea masters was as much about the ceremony as it was the leaves. In Japan, we were fascinated by the equipment and ceremony involved in tea preparation. We experienced delicate tea bowls, beautiful side-handled teapots, bamboo whisks, and, for the first time, the reinfusion of tea leaves. These wares and processes were all about taking time, appreciating each moment from the appearance of the dry leaf to the scent of the freshly infused leaves, and slowing down to appreciate the tea itself. This was very different to the tea rooms in the UK, and for us it was more exciting. We wanted to drink tea like this back home. We started buying a few pieces of traditional teaware on our travels to take home and practice tea making. I remember painstaking efforts to get the temperature for the tea just right; trying to elegantly pour tea from a kyusu and forgetting to hold the lid; feeling awkward and unfamiliar with this new equipment; returning to more familiar teapots. It soon became apparent however that the tea just never tasted the same. So we became a little braver, took a little more time, and it started to become normal to reach for a gaiwan or kyusu as the standard way of making tea. Our initial ideas of directly sourcing great teas and using traditional tea service were further shaped by travels to Sri Lanka, Taiwan, and China in this period. Here we learned more about tea service. In China we experienced how tea service is very intimate, often sitting with the person serving us. This sharply contrasted tea in Sri Lanka, which was akin to the British style of service in large teapots and formal settings. We decided that our service would sit somewhere between the two styles. 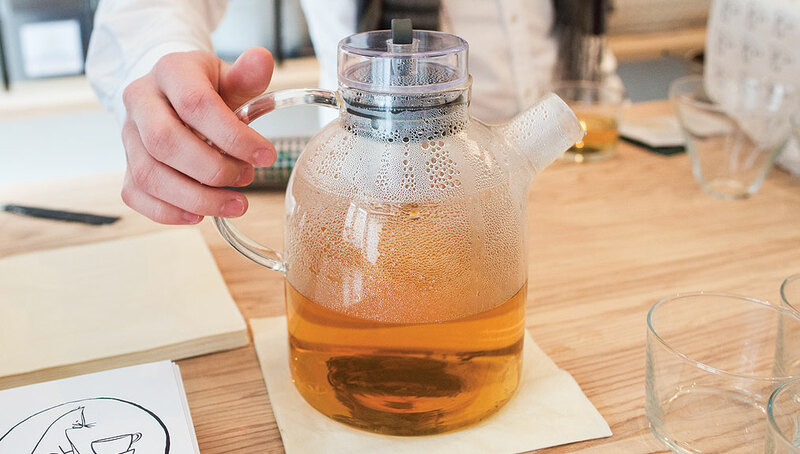 We wanted to create intimacy with our customers—a connection beyond just placing a pot of tea in front of them—but we felt that for the British market it was going too far to sit with our customers at the table. Instead, we would always serve the first infusion, explain the tea and, if appropriate, how to reinfuse, and then pass control to our customers. This personal service and connection instantly builds a bridge with customers and we connect over a common interest. It matters not who the tea drinkers and the tea servers are, the importance is the moment, the appreciation, and the connection. So who comes to Comins Tea? This is a question we are commonly asked and we always answer in the same way. Our customers come from all walks of life, but they have one thing in common: they are open minded. They are willing to walk into an unfamiliar space and open themselves to a new experience. The start of the Comins experience is always the same. We introduce the menu once our customers are seated, which indicates that there is no need to rush or make a hasty decision. The rest of the experience is defined by the customers; our team is encouraged to listen to customers and read their mood and body language. We welcome everyone, from lone tea drinkers seeking a moment of calm and solace to groups celebrating special occasions. There are customers who want to intricately discuss every detail of the menu, those more familiar with Comins who know what they want, and others seeking a recommendation. When asked what tea we recommend, we often ask people how they feel. Do they need refreshment, a warmer, a moment of calm? We train our team to deeply understand tea and build a connection with it. You need to feel tea within your body in order to understand what a tea can offer an individual. You will always see our team making and drinking tea for themselves in the tea house. It is not a perk of the job—it is the job. This whole experience is a world away from the traditional British tea experience, but increasingly we find that it is what people are looking for. Away from technology (we don’t offer Wi-Fi), our spaces are quiet and minimal in their design, and people comment that they feel the space is different as soon as they walk in. Customers are put at ease by our welcoming team and they soon realize we are not here to preach tea, but to engage in an exchange and dialogue. As my life in tea has progressed, I have become increasingly interested in meditation. As a result we have a one-minute, mindful meditation on the back of our menu. You will often find people in the teahouse enjoying tea and a moment of quiet as they undertake the meditation. That is the type of space and atmosphere we try to create. This story of our travels, the people we’ve met, and the tea we’ve enjoyed, helps to explain how the Comins tea experience has evolved. For us, to simply serve all teas in the same way is not an option. Our business has become all about connection; connection with the product, the people who produce it, and importantly for us, connection with customers at our tea houses. We strongly believe that by sharing traditional brewing methods, tea drinkers gain a greater understanding of the qualities and origins of each tea and experience something special. Our roots are still British—we use locally sourced wood for our tables and counter, and we work with British designers to produce our tea bowls and pots for traditional black teas—but the tea experience at Comins is global. 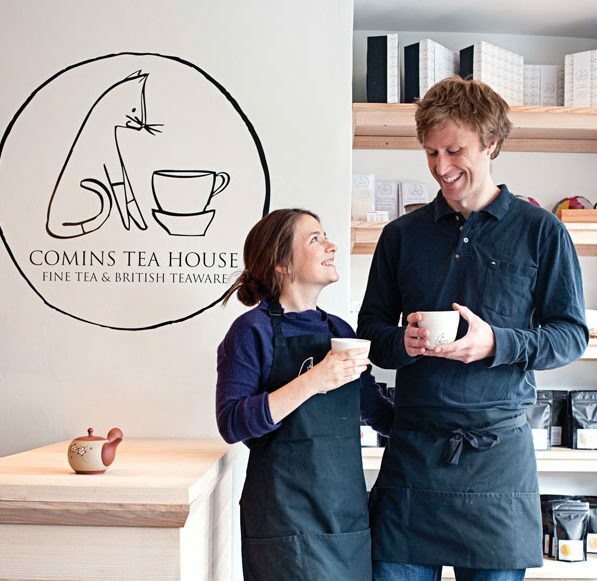 —Michelle Comins and her husband, Rob, own Comins Tea House in Bath and Sturminster Newton.